Today we flew back out to Cincinnati Ohio to bring little Mr. Mason and his Mom back to Stafford Va. We had flown them out there on the 10th for his appointments at the Cincinnati Children’s Hospital. We departed home base Luray with cloud cover that was hugging the tops of our local mountains. The ride was very smooth as we climbed on up to 8000 feet (we came out on top of the clouds at about 5000 feet) the view below us seemed to be an endless sea of clouds and still the ride was smooth as silk. We did have a noticeable headwind component as we headed west towards Cincinnati. Towards the middle of West Virginia we crossed over a very defined edge of the clouds along a mountain ridge. To the east from which we had come was solid cloud cover but to the west was clear, until we got further into Ohio, then we were back over the clouds once more. As we approached Lunken Field they were using the ILS to runway 21L for arrivals, but we ask for and received the GPS to runway 25. Once on the ground we found Mason and his mom waiting for us (timing worked out GREAT). Mason was ready to get home (he does not like the Hospitals to much and I cant say I blame him) so we were soon loaded up ready to depart Cincinnati to head eastbound to Stafford Va.
We departed on runway 21L and after clearance from departure control headed on up to 9000 feet. The ride all the way to Stafford was smooth and we were mostly over the clouds with the ground coming into view from time to time. As we neared Virginia the clouds below us became solid with no ground visibility at all. On our arrival into the Stafford area we requested a GPS into runway 33 so that we could get down thru the clouds. We broke out at about 1200 feet AGL with the runway in sight. After unloading and getting into the FBO we gave our goodbyes to Mason and his mom Dorothy and we knew they both were glad to be home. Then we loaded back up and departed Stafford climbing back up thru the clouds heading for home. Finally as always, we ventured off on one of the most dangerous parts of our day, the ride home ! We hope all the best for Little Mr. Mason, such a brave little fella with such a large load to carry ! Hope you enjoy the following photos of our flight………………..
Critical phase of flight…… our I.A.P. (In Air Picnic) ! Farm in Ohio….. Looks like a Giants Green on a Golf Course ! Looking down on top of the clouds….. can you see the circle rainbow created by our airplane ? Please feel free to leave any comments below…… We LOVE them ! (Please leave your name with your comment if you can). 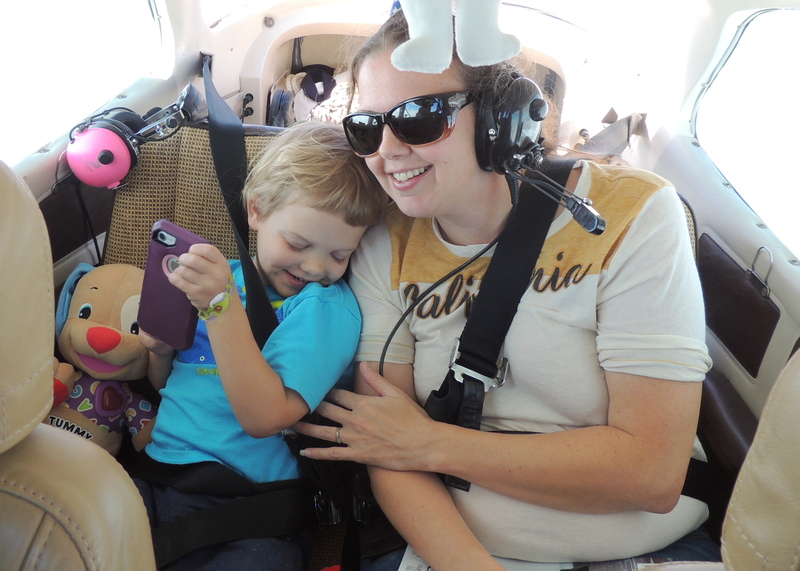 Thanks so much for your time and help us spread the word about Angel Flight ! Did you say, Frog, Captain John? To me it looked like an Eagle! What beautiful views That cloud cover where we can use our imagination knows no bounds. I always used my imagination with the “Clouds of the 464th.”, but my mind was always on business at hand, just as you. You’re one in a million! Thanks for these “Angel Flights”). Thank you for this flight a year ago!! Mason is doing so much better this year than last! We have moved to California!! Hi! ……. that is GREAT news!!!!!! Tell Mason we both said Hello! Frog did you say? Looked like a bird, (eagle? ), ready to fly off And that cloud cover? Looked like some sheep’s head above the wooly mass and the Rainbow? Easy…..The eye of God. Flying? It’s in the eye of the beholder. Great photos, and I’m sure, a great flight was had by all. Thanks, gentlemen…. Thank you Ralph for following our flights!